For a few years now at D.P. Todd Secondary we've been using a special "Echo Project" for Social Studies 11 to put student identity at the centre of the course. The idea is fairly simple -- students interview someone to learn more about Canada in the Postwar Era with the goal of making a personal connection to the curriculum. The thing that turns this basic idea into something memorable is the urgency we place on the task. The SS11 students we teach right now (and over the last few years) are at the tail end of the Echo Generation, the children of the late Baby Boomers or early Gen Xers. In turn, their grandparents were mostly born before or during WWII, and their great-grandparents were around before the Great Depression. What an incredible resource -- we have people beyond the 50-yr gap all around us, many with incredible stories to tell. There is a retirement complex across the street from the school, for example, that has at least five WWII vets in residence. I believe that societies need robust connections over the 2-generation gap (about 50 years) if the society is to remain whole and progressive. Breaking the gap, breaking the continuity with grandparents for example, leads to confusion of values, dysfunctional habits, and narcissism. Maintaining conversations with the elderly among youth is vital; these students truly are the Echo -- the voices of something deep (powerful) and distant (at risk of being lost) that skips past the immediate horizon and comes alive when it is least expected. In other words, students will learn stuff from the elderly that they can't learn from their parents or other adults (teachers included). Surprisingly, what they learn often involves risk-taking, living large, and being really good at a few important things. I think the students involved in the Foxfire project knew what this was about -- they knew the urgency of collecting knowledge and perspectives from the elderly. For those students in Georgia of the 1960s and 70s, the rapid disappearance of Appalachian culture compelled them to gather stories, recipes, crafts, wisdom and lore from the locals. It is the same urgency we try to instill in our students -- the pre-war generations (arguably with the best perspective on postwar society) are fewer in number each year (and were fewer to start with). One of our students "found" an interview subject that was 102 -- this is someone with personal memories of every major event from the SS11 curriculum, and an authentic view on our course themes: politics & gov't, autonomy & identity, society & culture, economy & environment. Soon it will be difficult to find anyone with firsthand experience of the Great Depression and eventually WWII. We were studying WWI in class two years ago when Canada's last vet of the Great war died. Our WWII vets average age is 88 and number less than 125,000. In SS10, most of our students built Heritage Projects around their own family or cultural backgrounds, exploring themes like traditions, migration, cultural values, subsistence, and lots of cool stories and connections to historical events and motifs. This SS11 Echo Project is a chance to pick up one of the strands and follow-up with how their "heritage" evolved in the postwar era. Most of our students pick a grandparents to interview, but many gravitate towards an elder they know in their community. Like the Heritage Project, the results are amazing -- students making bold connections to ideas and learning outcomes from our course with passion and scholarly insight. I've just finished marking the various Echo Projects that have come in over the last few weeks from three SS11 classes and I must say I am overwhelmed. They learned so much from their interview subjects, they asked such meaningful and profound questions (even if it was sometimes just about music or fads), and they spoke and write so respectfully about the unique and eccentric knowledge they gained from the process. As one student put it, you just don't learn this kind of thing from Google. It is no surprise that student learn more, faster, and deeper when their identity is on the line. For example, many students are bored by the details of the Avro Arrow story... not so the student whose grandfather was an actual engineer for the Avro project. His passion in understanding the nuances of the Avro story came alive for the other students and they caught the idea that the story was important (as it once was to many Canadians). Another student walked us through the emotional toll of military service and the question of what Canada's role should be on the world stage, focusing on Cyprus where his dad served as a Canadian Peacekeeper. His presentation coincided with a class activity looking at Canada and the UN and whether Canada should aim to be a middle power or a model power (activity and an 11x17 evidence page which they use as a study buddy for a unit test). I'd wager the class learned more from the authentic student presentation than my complicated middle/model power exercise. I'm still haunted by one student's family story. Her great-grandmother wrote diaries from the 1920s to the 1960s chronicling her own life and also how she felt about the world around her, including WWII and her family's immigration to Canada. When she passed away in the 1970s, her daughters and son were left with the task of sorting through the boxes and boxes of journals. The daughters wanted to break with the past, to forget about Old World grief and grievances, and so they set fire to the journals. The son (my student's grandfather) was devastated and had a falling out with his sisters that never really healed. My student interviewed him for her Echo Project and tried to recreate what her great-grandmother must have seen in her life. As you can imagine, the student now feels an urgency to begin a journal of her own, to write about her life and the world around her. Another student learned about an 92-yr-old man and got the nerve up to interview him. He and his wife were the parents of my student's grandma's best friend... that's how these things work! He was hard of hearing, hard to understand and my student tried to get as much down on paper as she could. It turns out he had served on Lancaster Bombers in the Canadian Airforce in WWII. Then serendipity takes over. My student's great-grandafther had also served as a Lancaster navigator. He was killed in action, but was an important part of the student's documented family history. Interviewing a veteran navigator gave her an insight into what her relative went through in the airspace above Germany before he was shot down, something missing from the family record. Of course, it broadened her understanding of Canada's role on the international stage and was a point of connection in the course that had previously been lacking. I started the course worried about this student's progress but am now so proud at her level of engagement. The cool thing is that she decided how and when to get interested. I'm teaching 4 for 4 right now and I haven't had the time to archive the projects and blog about the individual results as I had wished, but I wanted to take a few minutes and lay out the excitement I had for the students' work and give a sense of how this project is set up. I'll put some more comments and excerpts from the student projects together as I find time. You are the Echo. Generation Y. Born in 1996, most of you. What does that mean? 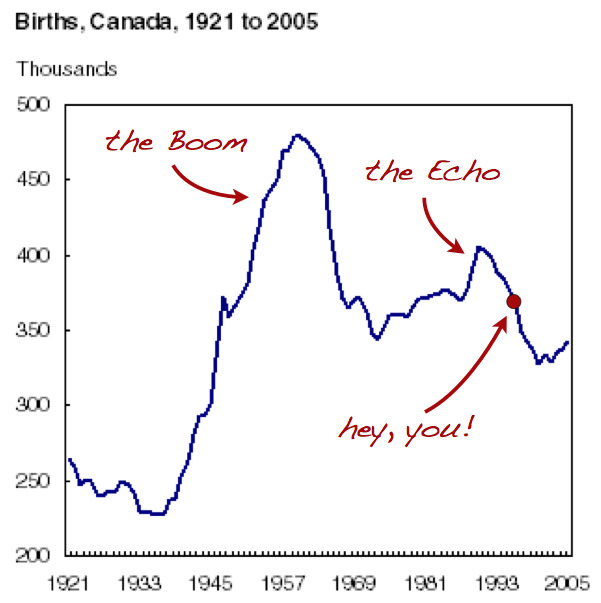 Your parents, for the most part, were the last part of the baby boom generation that followed World War Two and lasted until the mid 1960s. Some of you are the children of Generation X, the ones that followed the boomers in the late 1960s and 1970s. The median year of your parents’ birth was 1967, your grandparents, 1940. What this means is that your grandparents grew up in the 1940s and 1950s, when Canada was quite decidedly not a British colony but was in danger of becoming an American colony. When the Soviet Union was the bad guy, the commies were coming, and the world would probably end in thermonuclear war. They know a thing or two about hippies, about cars, about jobs, food, clothes, hobbies and jokes that don't really fit in anymore. They observed, or joined in, as minorities, women, and Aborginal Canadians gained more rights. They witnessed the big events of the postwar period and probably harbour opinions you won't find in a textbook. Some came to this country as a new homeland, and were able to test Laurier's theory that "Canada is the star to which all men who love progress and freedom shall come." Some of them were called DPs as kids, and did not like it. They'll have strong thoughts on Trudeau, on the Quebecois, on Americans, on environmentalism. A substantial number of them grew up on a farm, and were adults before they ever boarded a plane. Medical care was not universal for them, and they sang "God Save the Queen" in school while looking at a different flag than we have now. Many will start a conversation with "you got it easy these days" and many will finish a conversation with a telling look that says "I can't believe we haven't talked about this stuff before." The important thing is that when you reach past a couple of generations, you will learn something important from people that hold memories that will soon be forgotten. If you ask the right questions, you'll find that everything they say will give you an authentic perspective on Canadian Identity and other big ideas from our course. Structure your Echo Project around what you have learned from an interview with someone who lived through and understood some of the key issues of the postwar period. Your research, work, and presentation could involve documents, photos, artifacts and other primary sources. You may end up talking about some of the research topics from our "Postwar" list, or something completely different. You should also try to address a few of the elements of Critical Inquiry (the circle graph we looked at in class). For an interview subject, three things are desirable (but not always necessary): 50 year gap -- born before 1947, experienced -- they have interesting stories to tell, and important to you -- someone you would really like to talk to. The rest of the project details are explained on the handout, including suggestions for format and sample interview questions. SOCIAL STUDIES ... Whatcha Thinkin?